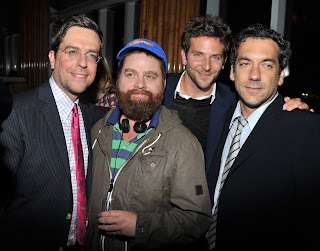 Home / Bradley Cooper / Ed Helms / Legendary Pictures / movie / Todd Phillips / Warner Bros. / Zach Galifianakis / Warner Bros. Ready for Another "Hangover"
Warner Bros. Ready for Another "Hangover"
Director Todd Phillips will reunite with Bradley Cooper, Ed Helms and Zach Galifianakis for Part III of the blockbuster comedy franchise, to open on May 24, 2013. BURBANK, CA, March 22, 2011 – Warner Bros. Pictures and Legendary Pictures are reteaming with Todd Phillips for “The Hangover Part III,” the third installment in the record-breaking comedy franchise, which is slated for release on May 24, 2013. The announcement was made today by Jeff Robinov, President Warner Bros. Pictures Group.